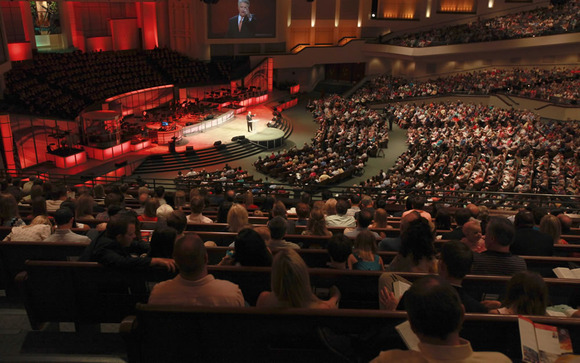 LAS VEGAS, Nevada — One of the largest “megachurches” in North America, Prestonwood Baptist Church in Plano, Texas, is currently receiving an upgrade to its HD broadcast facility and live sound reinforcement system, courtesy of Clair Brothers Audio Systems. Highlighting these upgrades are three HARMAN Studer Vista digital mixing consoles. The weekly message preached from the Prestonwood pulpit is viewed and listened to all over the world through PowerPoint Ministries—the radio, television, and Internet ministry of the church. The message is also live streamed and available on iPhone and Android apps. The weekend services at the Plano Campus of the church vary from a contemporary service on Saturday nights consisting of an 8-person rhythm section, an 8-person praise team, a worship leader and a 30-to-40 minute sermon. Sunday services consist of a 6-person rhythm section including Latin percussion, a 10-person praise team, a 40-piece orchestra and a 350-voice choir under the direction of Worship Pastor Todd Bell. The message from Dr. Jack Graham, pastor of the 30,000-member church, is simulcast to two other campuses along with a live streaming webcast. “All in all, an average Sunday morning service has an average of 120 channels,” said Chief Audio Engineer Chris Schutz. In addition to the weekend services, the worship space at Prestonwood is used for multiple events throughout the year, including worship services for the Prestonwood Christian Academy, performances by students and children and other special events. Not all events are Prestonwood driven, however. The biggest requirement of the audio system at Prestonwood is flexibility, said Broadcast and FOH Engineer Armando Escobedo, as many of the events at the church run close together. The media team at Prestonwood will be relying extensively on Studer’s AutoTouch Plus Dynamic Automation, to allow for the post-production results to be similar in tonality to the live mixes, Schutz said. For more information on Prestonwod Baptist Church, please visit www.prestonwood.org. For more information on PowerPoint Ministries, please visit www.powerpoint.org. For information on Clair Brothers Audio Systems, please visit www.clairsystems.com.